Though few Canadian animations from the silent era survive, there are four existing films (safely preserved at Library and Archives Canada in Ottawa) made years before the formation of the National Film Board of Canada in 1939, that have much to say about the production and distribution of early animation north of the border. Situating silent-era Canadian animation within the silent-era Canadian film industry as a whole reveals two essential postwar developments: one, patriotism prompted a flurry of film production in Winnipeg, Montreal and Toronto; and two, the federal and provincial governments established motion picture bureaus to advocate for the industry. Despite these advances, the nascent Canadian film industry, and by extension, the nascent Canadian animation industry, was marginalized within the North American marketplace. From the outset, in such a competitive cultural landscape, with limited access to production and distribution resources, Canadian animators were compelled to place commercial interests over creative interests. Out of necessity and not innovation, their animated films were infrequent, unoriginal and utilitarian, but now are instructive and illuminating in their challenges and failures. In examining early Canadian animation, the place to begin is Winnipeg, Manitoba. In a chapter for Jerry White’s book North of Everything, Gene Walz suggests, “There was… a discontinuous but not inestimable history of film animation in the city… Winnipeg, like Kansas City where Walt Disney got his start, is not as unlikely a place for animation as it might seem” (White 73). In an earlier article, Walz asserts, “Winnipeg has a longer and steadier ‘history’ of animation than most other cities in North America” (Walz 3). Indeed, Quebec-born documentary filmmaker Jean Arsin came to the city in 1909, joined by fellow Quebecer Charles McKenzie Lambly in 1910. Together they created rudimentary paper cutout and puppet animation, on 35mm nitrate stock, in a makeshift studio in a sandlot and tarpaper shack on Selkirk Street in the dilapidated North End of Winnipeg. Though Arsin and Lambly would leave Winnipeg in 1920 for more prosperous Montreal, their early animation experiments would likely not have gone unnoticed by filmmaker Jack (J.A.) Norling. In 1919, Norling and writer William Ganson Rose were commissioned by the Federated Budget Board of Winnipeg, to produce a short film to promote philanthropic giving. The film, The Man Who Woke Up, is a live-action Dickens adaptation, with an Ebenezer Scrooge-type who refuses to give to charity, until one night, he falls asleep and dreams of the terrible social consequences of his miserly ways. His dream is a two-minute animated sequence, the oldest surviving piece of Canadian animation. Jerry White describes the azure-tinted animation as “drawn realistically rather than as surreal or comical figures, and the animation is convincing, if minimal” (White 74). The animation is an unambitious hybrid of European and American techniques. On the one hand, characters are inked in the style of newspaper illustration, and animated on a static horizontal plane, with movements articulated simply by joints at the hip and shoulder. This style evokes the political cartoons of British animators like Anson Dyer and Dudley Buxton. On the other hand, there are characters drawn in a more comedic style, with cutesy faces and rounded bodies, animated with cycles of cartoonish bouncing. This style evokes the big three New York animation studios. (In fact, Norling would later join Bray Studios in 1922, where he would write, direct and animate a series of six shorts called Technical Romances.) Nonetheless, clearly missing from the animation of The Man Who Woke Up are Canadian themes and imagery, no doubt a function of its commercial origins and intended purpose as a public service announcement. “Though exhibitors in Canada reported ‘business excellent’ in relation to Camera Classics, the series received no foreign distribution. A group of American exhibitors were brought to Toronto for a special preview – Irish was nothing if not ambitious – but no bookings followed… Camera Classics might be good but why should American theatres show them when they were already deluged by comparable films produced by Hollywood?” (Norris 145). The Camera Classics series would end in late 1922, a not unsuspicious fire would destroy the Filmcraft studio in September 1923, and Irish would die from a staph infection one month later, with his films failing to reach west beyond Winnipeg or reach south into the U.S. market. The Canadian animation industry declined from 1923 onwards, faced with continued production and distribution pressures. However, in 1926, Montreal-based Jean Arsin and Charles Lambly (assisted by Winnipeg filmmaker Francis Holmes) were able to produce the twenty-five minute showcard cutout animation Romulus and Remus, commissioned by the local Catholic Diocese. 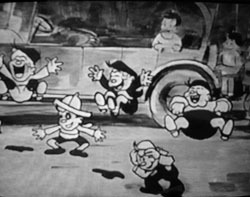 Also around this time, Toronto-based Walter H. Swaffield animated the public health film Tiny’s Troublesome Tooth (c. 1925) for the Ontario Motion Picture Bureau (OMPB). The OMPB was the first state-sponsored film organization in the world, founded by the government of Ontario in May 1917, with a mission to provide “educational work for farmers, school children, factory workers and other classes” (Norris et. al.) Certainly, the twelve-minute film, produced by Filmart Motion Pictures, delivers on this mandate, providing quasi-scientific information on plaque and germs, with recommendations for proper dental hygiene practises. The tone of the film is both serious and silly, with dire warnings of abscesses, heart disease and rheumatism to those who would ignore the health of their teeth, interspersed with cheeky clips of the “Germ Family” partying in the dentin of Tiny Tim. The inter-titles belie a hyperbolic fear of germs; even pencils, one of the primary tools of animation, are said to be teaming with disease-causing germs. In its animation, the film blends European and American techniques. The character of Tiny Tim is drawn in detailed illustration, while the germs are simple stick figures drawn in heavy black outline. There are also repeating cycles of stylized anatomical drawings, showing how the germs decay the tooth, attack the “pulp nerve” and enter the bloodstream. Various body parts are labelled in large boxed text, presumably to add scientific credibility and educational value to the film. Though overall the animation is fairly uninspiring, at the end of the film, the audience is treated to a dancing toothbrush and dancing produce, and a happy kid who has learned a painful lesson. Ultimately, much like The Man Who Woke Up, Tiny’s Troublesome Tooth does nothing to advance the animated art form, or provide insight into the nationality and individuality of its animator, but it does effectively serve the propagandistic agenda of its funders. The last of the silent-era Canadian animators was Bryant Fryer, originally of Gault, Ontario. He first became involved in the animation industry while a student under puppeteer Tony Sarg at the Art Student’s League in New York. Sarg enlisted Fryer as a production assistant on nearly fifty films in the animated series Tony Sarg’s Almanac from 1921-1923. In 1923, Fryer joined Bray Studios, though it is unclear whether he encountered fellow expat J.A. Norling there. Mark Langer, in his essay “Embattled Silhouettes”, speculates that Fryer’s stint with Bray was less productive than with Sarg: “Either Fryer decided that the factory production techniques of cel animation pioneered by Bray were not to his liking, or Bray decided that Fryer’s talents were not suitable” (Langer 70). 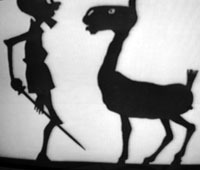 Returning to Toronto in 1927, Fryer pitched a proposal to the newly opened Toronto branch of New York firm Cranfield and Clarke to distribute a series of silhouette puppet films called Shadowlaughs. Colonel W.F. Clarke convinced Normann Gunn and Allen Beattie of Filmart, the same company that produced Walter Swaffield’s Tiny’s Troublesome Tooth, to underwrite the series. “The figures were cut out of opaque material and cardboard and joined together in sort of anatomical fashion. And we worked on a slopping glass plate which was about 30 inches wide and not quite as high as that. The backgrounds were made either of opaque paper or layers of tracing paper which were traced on the back of the glass plate we worked on. The figures had some sticky material on them… so they wouldn’t slide down the glass. We’d just pick them up and move them around against this background that was lit from behind” (72). Mark Langer astutely observes the influences of Tony Sarg not only in the silhouette techniques but also the “fancifully adult subject matter… [and] stone-age themes” (72). 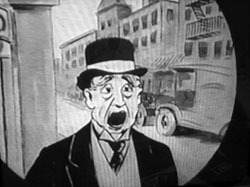 Karen Mazurkewich in Cartoon Capers not unfairly assesses the film as “sloppy” in its pacing, and given his previous filmmaking experience, Fryer’s animation is admittedly halting and repetitive, with flickering and uneven exposure, and limited simultaneous movement (Mazurkewich 17). Fryer’s second film, the ‘medieval romance’ One Bad Knight, earns more praise. Like Follow the Swallow, One Bad Knight presents a standard fairy tale: the noble knight Sir Ronald, with the help of his trusty horse Black Beauty, rescues a heroine kidnapped and held captive in a tower by the evil Rancid Randolf. Unlike its predecessor, the second film offers a more complex flashback framing narrative, more two-dimensional characters, dashes of humour and action, and smoother animation. In particular, the heroine, an exotic dancer at the Hot Dog Knight Club, is delicately rendered. Mark Langer calls both films “competent efforts” (though nowhere in the same league as Sarg or Reiniger) and speculates that “production methods may have contributed to the mediocre quality… Since their animation stand was on an angle, and the figures had to be fixed in place… it was awkward to position and manipulate the jointed characters” (Langer 74). The two Shadowlaughs shorts were produced over July and August 1927 at Trenton Studios, which had been bought out by the Ontario Motion Picture Bureau. During these two months, Fryer was working “under adverse circumstances… on the margins of industrial practices” while maintaing a day job to support himself and animating his films by night (67). Soon after, with Cranfield and Clarke nearly bankrupt, and Filmart seeing no potential return on its investment, Shadowlaughs was scrapped. Follow the Swallow and One Bad Knight were distributed by the OMPB as part of an educational package, in a “non-standard 28mm distribution” to rural audiences (79). Twelve Shadowlaughs films had been planned, and two films, Help Wanted and Bride for a Knight, appear to have been in development, yet not one was ever released theatrically. Undoubtedly the struggles of Bryant Fryer to get his films to market are indicative of the struggles of all Canadian animators during this period: the artist was willing but the financing was weak. Mazurkewich states simply, “Until 1939, animation production in Canada was rare. The talent, however, was not. Like Fryer, most artists drifted across the boarder to find jobs in New York and Los Angeles” (Mazurkewich 19). For the animators that stayed on or returned to Canada, the reliance on government and corporate backers limited their imagination and failed to open new distribution channels for their work. Canadian animation would ultimately remain “un art jeune” until more than a decade later with the creation of the National Film Board of Canada and the arrival of Norm McLaren in 1939 (De Blois 83). Mazurkewich, Karen. Cartoon Capers: The History of Canadian Animators. McArthur & Co, 1999. Norris, Peter. Embattled Shadows: A History of Canadian Cinema, 1895-1939. McGill-Queen’s University Press, 1992. Walz, Gene. “Shack-Wacky Animation: The Case of Manitoba”. Ed. Beard, William and White, Jerry. North of Everything: English-Canadian Cinema Since 1980. University of Alberta Press, 2002. Langer, Mark. “Embattled Silhouettes: Animation by Bryant Fryer”. Animation Journal. Ed Furniss, Maureen. Vol. 10, 2002. An excellent article. I salute your scholarship, ma’am, and look forward to more! Thanks, gentlemen! On my next trip to Ottawa, I want to screen Filmcraft’s The Great Lakes (c.1922) at Library and Archives Canada, as I hear the film contains “cartoons”. And yet I bothered listening in to what is used for “Tiny’s Troublesome Tooth”. It’s like they’re being desperate to get someone to watch this. Hopefully Tom Stathes never stoops this low! A simple piano/organ is all that’s needed. Nice to give a shout out to Mazurkewich’s book. I still have my copy of it! You can blame Ontario indie pop band The Hilotrons for these soundtracks! Thanks for a very interesting article on an often overlooked aspect of animation and film history. This is a very interesting article on an overlooked topic. It has to cover a lot of ground very quickly: could it be developed into a book, perhaps?